I've always had an inexplicable dislike of Capability Brown, the man responsible for designing so many estates now owned by the National Trust. He got his name because he would visit a place and tell the owner that it had "capabilities". They would then pay him a substantial amount of money and he would move some hills or install a lake to brighten the place up. Today, at Berrington Hall in Herefordshire, I realised where that instinctive dislike comes from. For A Level English, I had to study Mansfield Park by Jane Austen. The characters go and visit a stately home belonging to Mr Rushworth, whose head is full of "improvements" and his desire to hire Humphry Repton to give the place a makeover. But the point is that Mansfield Park's prim little heroine, Fanny Price, is aghast at all of this improvements talk. And so I've always assumed that Jane Austen didn't approve of improvements either, and she's usually right about everything. Ergo, without realising it, I decided in 1990 that 'improvers' were bad and this dislike resurfaced, like Godzilla, 25 years later when I finally came across any. You might well be wondering why I took against Capability Brown when it was actually Humphry Repton that she mentions. I am wondering the same thing. But Repton is often regarded as Brown's successor, so there you are. Let's not split hairs. ANYWAY. What has all of this got to do with Berrington? The answer is that Thomas Harley commissioned Capability B to design the grounds and CB's son-in-law, Henry Holland, to design the house. Thomas had made his money through marriage and by winning the contract to provide clothing and wages to the British army in America - according to the guidebook "in 1777 alone he supplied over 40,000 pairs of mittens"
The Admiral was beset by financial problems and in a letter to his son, he tells him to visit the (very wealthy) Thomas Harley "and if your heart is touched by either of his Daughters, indulge the Flame"
But of course there is one area where I am always happy to see improvements, and that is the area of SCONES. 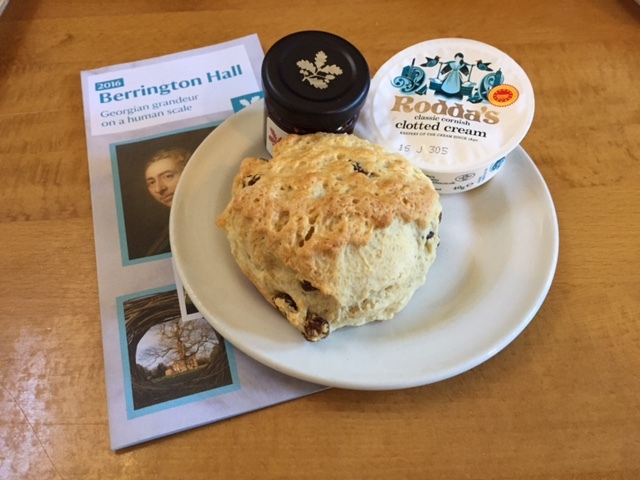 I didn't have high hopes for the Berrington scone - it looked a bit ordinary and underwhelming (a bit like Fanny Price). But it was absolutely delicious - fresh and tasty. First 5 out of 5 of the year! Hurray! he had to get his face in somehow. I'll end by sharing this link. It lists all of the properties connected to Capability Brown. There are 240 of them!!! I'm surprised there was anything left for Repton to improve for his 5 guineas a day. If an estate agent said to you "this is a property with great potential", you'd instantly smell a rat and think "OK, it's a dump". But when I tell you that Croome near Worcester has great potential, I really mean it. buggy-thing and...well, let's just say you can tell. This basically means that there's very little in the house - all of the effort so far has been on new plumbing, electrics, and structural stuff. I have to admit that we didn't see all of it - the Sidekick's mobility is a bit limited at the moment - but after I'd seen four or five empty rooms I started to lose track of where I was. The park has been restored to its past glory, however, and there's a lot to see (see 8. below). The Master Bedroom was decorated by a property developer in the 1990s. The guidebook says that the NT "has decided to leave it as it was during this period for now", going on to correctly compare it to "something out of Footballers' Wives". The stripey wallpaper certainly grabs the attention, but not as much as the ruddy great modern bath that the property developer stuck in the middle of the bathroom, for reasons that were presumably clear to him or her at the time. It was too heavy for the floor though, which bowed underneath it and had to be strengthened while the plumbing was taken out. So don't bother bringing a towel. There's a huge irony in me saying that Croome has 'potential'. 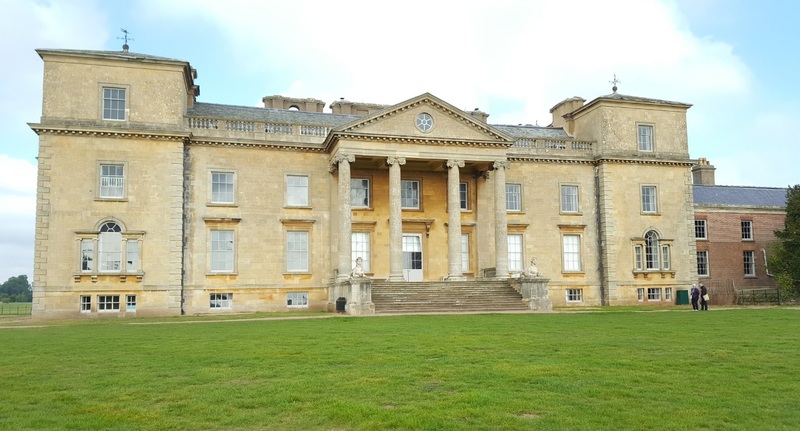 Lancelot Brown, who designed Croome, got his famous nickname of Capability because that's what he used to tell his rich clients when he visited their estates - 'your gaff has capabilities', or words to that effect. 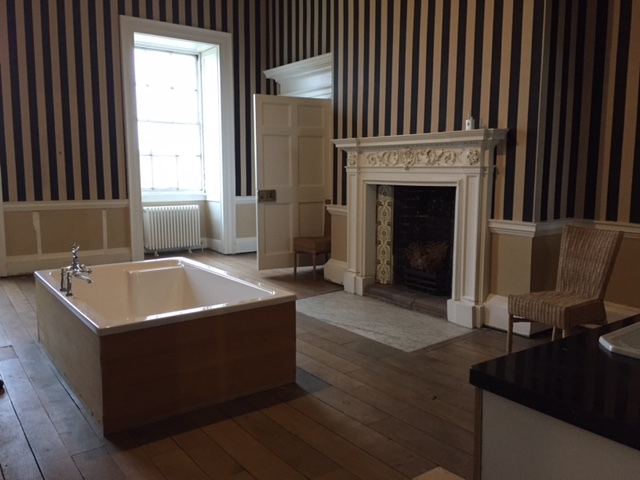 Anyway, Capability was commissioned by the 6th Earl of Coventry as an architect to redesign the house that he had inherited in 1751. CB designed the outside of the building and was the clerk of works for the interior. But it was in the grounds that he developed his signature style as a landscape gardener, doing away with all the formality of previous eras and focusing on trees and serpentine lakes. 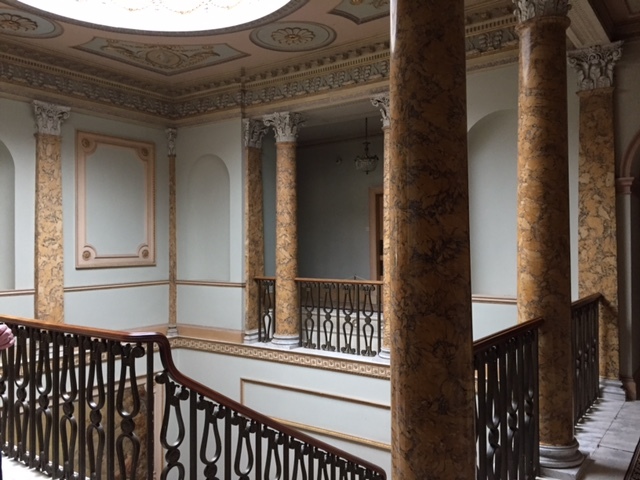 The 6th Earl was clearly a bit of a talent spotter, because he also employed the little-known Robert Adam, or Bob the Roman as he was later referred to because of his love of classical architecture. Bob started off designing the interior of the new church but impressed the 6th Earl so much that he moved onto the Long Gallery and other rooms. 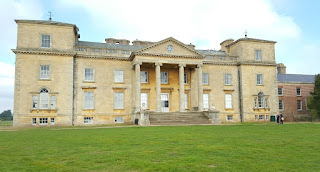 The descendants of the 6th Earl stayed true to his vision and kept Croome pretty much as he had built it. However, the 10th Earl was killed during the retreat to Dunkirk in 1940 and the place and its contents were put up for sale. Croome became a school and the UK headquarters for the Hare Krishna movement, before the property developers tried to turn it into a golf course. 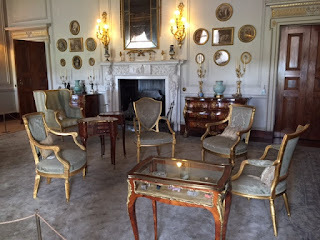 There's a very bare and sad-looking room in the house with some posters explaining that it was once the Tapestry Room, but that all the contents were sold to cover the 9th Earl's gambling debts. It was only when I got home and read the guide book properly that I realised the WHOLE ROOM is now in the Metropolitan Museum of Art in New York - the ceiling, the tapestries, the floor, even the skirting boards. The picture makes you realise how fabulous Croome would have looked. This is a terrible photo, but the team at Croome is bringing back various pieces that once belonged to the estate. 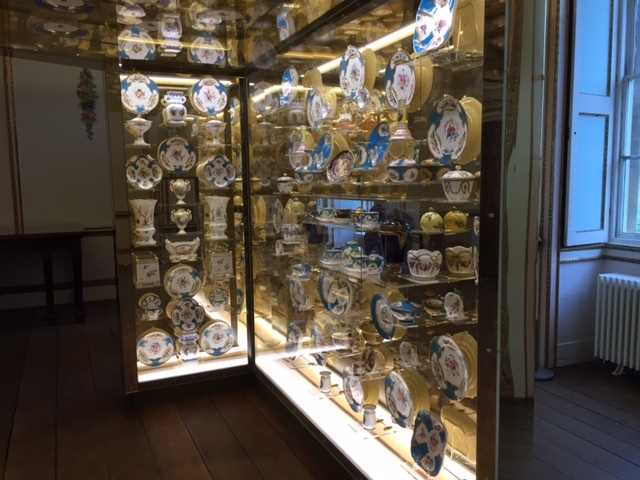 Below is a really stunning cabinet built to show off the porcelain that was once the Earl's pride and joy - I really don't find porcelain very interesting at all, but I loved the way it was set out. Much better than sticking it all on a table (and less prone to gathering dust presumably). There are numerous 'eye-catchers' or follies in the park at Croome - there's a grotto, Pirton Castle (which looks like a real castle but was actually built as a ruin), Dunstall Castle, a Panorama Tower, Dry Arch Bridge, Temple Greenhouse...loads of little buildings worth investigating. Due to mobility issues and - OK, yes, I admit it - the cold, we didn't see any of them. But it's another good reason to go back. 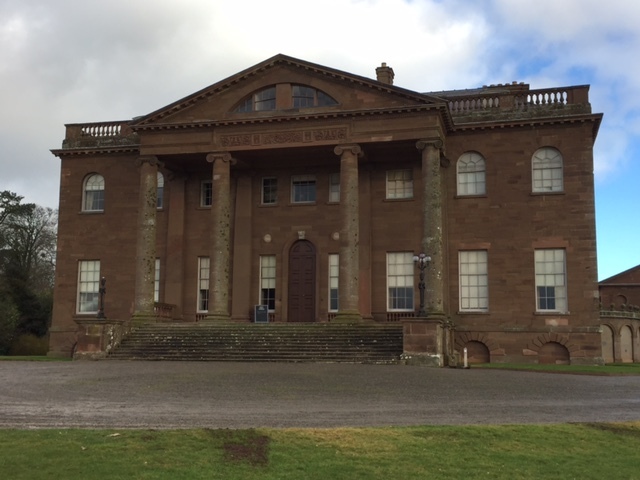 There are some properties where the volunteers are just brilliant - Nostell Priory, Packwood, Melford Hall, Seaton Delaval. Croome is one of them. They were friendly and informative, which made a really big difference when there was less to see. They also seemed genuinely excited by what's going on at the property, and they're going to need it - there's a huge task ahead and they'll need plenty of energy. 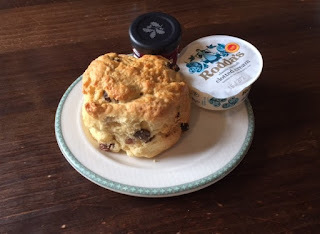 This was scone mission #150 and our first outing since October, so I was dreading a scone fail scenario. But I needn't have worried - a pile of mighty scones was the first thing I saw in the tea-room. They were very tasty, although (and I hate to say this) possibly a tad under-done? I'm not saying it in Paul Hollywood "it's-under-baked"-while-wiping-hands-triumphantly-of-potentially-lethal-baked-item-almost-ingested-style, but hesitantly because I'm not 100% sure. You'd think I'd be able to tell by now. Anyway. I can't wait to see Croome again in a couple of years' time, when they've had a chance to complete more of their renovations and restorations, and I can do a full tour of the 'eye-catchers'.